The history of Acupressure might be as old as the creation of civilization itself. The concept of acupressure originated in ancient China more than 5000 years ago. The Chinese discovered a gentle yet effective healing art which involved the pressing of certain special pressure points in the body to relieve pain and stress. In addition, is also benefited other body parts quite remote from the area of pain. In addition to healing pains and chronic diseases, acupressure can also be used in emergency medical situations like sudden cardiac arrest, sun stroke and high fever. Although, acupressure cannot replace specialized treatment, it can be used as a precautionary measure while waiting for the doctor that might help avert a catastrophe. An emergency situation always calls for specialized medical treatment, but its best to administer acupressure treatment on the patient instead of waiting passively for the arrival of help. In many cases, acupressure has helped in saving lives, and it is important for every individual to have knowledge of these basic acupressure treatments. Asthma attacks are triggered by allergic substances like dust, pollen, cotton or some internal allergens. During an attack, the trachea and alveoli get constricted and breathing becomes extremely difficult. Most of the attacks occur at late night hours or early in the morning. Acupressure works effectively in relieving asthma attacks. The Treatment for Asthma attacks involves four points. Each point has to be pressed for 1 minute. 1st Point- The first point lies 5 fingers-width below the elbow crease near the outer border of the arm on the thumb side. 2nd Point- The second point is located at the middle of the chest bone. 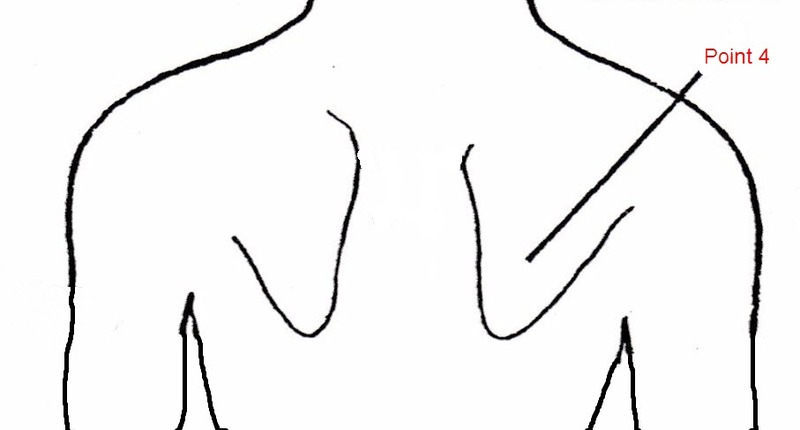 3rd Point- The third point is located at the base of the throat, in a shallow depression just above the chest bone. Stimulating this point also helps in cough relief. 4th Point- The fourth point consists of two points. 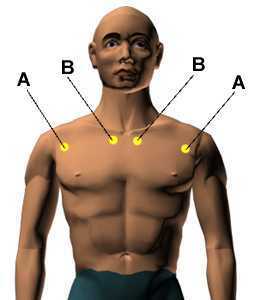 They are located at upper back side of the body right at the ending of the neck on the two shoulder blades. The treatment has to be repeated every 15 minutes till breathing turns normal. In today’s world, most of the people suffer from cholesterol and high blood pressure and as a result stroke and heart attack has become a common health hazard. Heart attacks occur when cholesterol buildup and plaque blocks the coronary artery and cuts out blood flow to and from the heart muscles. Acupressure has proved an effective recovery from chest pain and minor heart attack. The treatment for chest pain and heart attack consists of six points. Each point has to the pressed for 1 minute. • 1st Point- This point lies in the flesh between the thumbs and index finger. • 2nd Point- If a vertical line is drawn on the palm starting between the ring and little finger and straight towards the wrist, this point would lie on the line half a thumb-width above the wrist crease. • 3rd Point- This point lies at the crossing of the above mentioned line and the wrist crease. 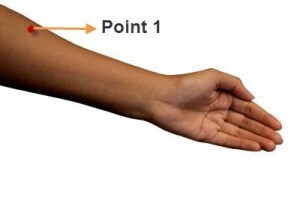 4th Point- This point is located at the centre of the forearm, 4 thumbs-widths above the wrist crease. 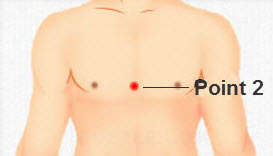 • 5th Point- This point is located exactly at the middle of the chest. • 6th Point- This point lies one thumb-width above the armpit when arms are closed against the body. The patient should have complete bed rest after suffering chest pain or heart attack and the mind should be relaxed and calm. After a severe heart attack, at times the heart stops beating, and the patient becomes unconscious. Associated symptoms involve stopped respiration, dilated pupil and absence of pulse. If the heart fails to resume beating again then the patient may die or suffer permanent damage to the brain. Therefore, it is very important to apply acupressure treatment while waiting for the doctor. At first it must be ascertained that unconsciousness has occurred due to cardiac arrest, following which the patient should be reclined on a hard surface, and his legs should be elevated with the help of pillows. Then the person helping him should apply a hard blow on the lower end of the patient’s middle breast bone, which helps the heart to start beating. However, if this fails then external cardiac massage and mouth to mouth respiration should be applied. 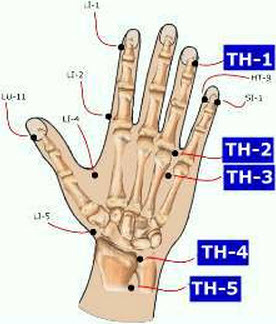 Another person might apply acupressure treatment on four points. 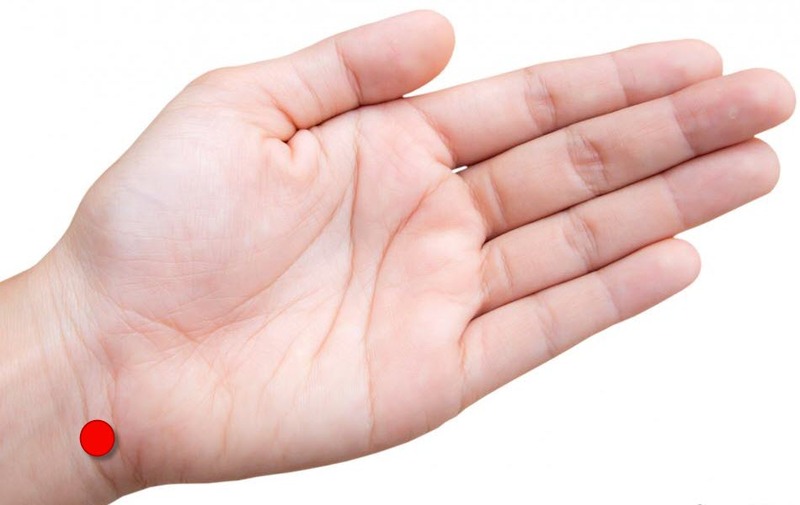 • 1st Point- If a vertical line is drawn on the palm starting between the ring and little finger and straight towards the wrist, this point would lie on the line half a thumb-width above the wrist crease. • 2nd Point-This point lies on the outer corner of the nail of the little finger. • 3rd Point- This point is located at the centre of the forearm, 4 thumb-widths above the wrist crease. 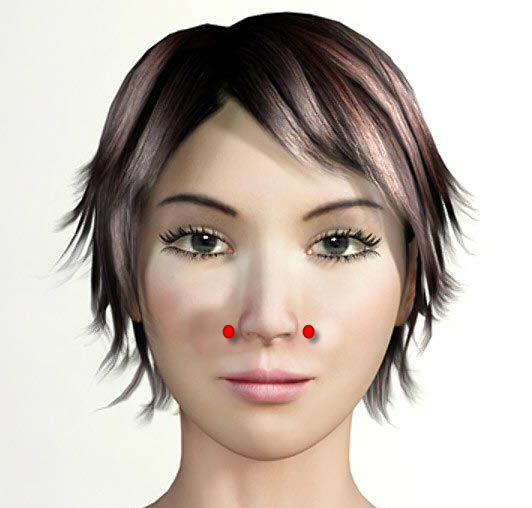 • 4th Point- This point is located just below the nose and above the upper lip. Appendix is a small tube of tissues that extends from the large intestine. In most cases Appendicitis is caused by blockage of appendix by stool, foreign bodies or affected by cancer. The appendix swells due to infection and causes sharp pain in the abdomen. Acupressure treatment can be used in an effective manner to get relief from acute appendix pain. The treatment for appendix pain involves six points. • 2nd Point- Bend your knee joint by 900, now move three thumbs-widths downward from the lower end of the knee cap. There you will be able to feel a pointed bone. 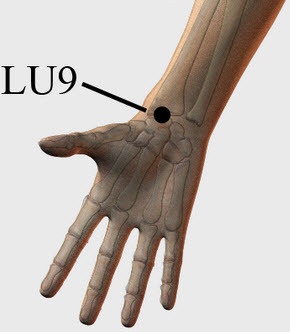 The 2nd point is located one finger-width to the outer side of this bone. Stimulating this point also helps control diabetes. 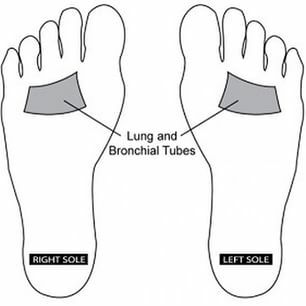 • 3rd Point- This point is located in the skin between the second and the third toes. 4th Point-From the tip of the ankle bone move four fingers-width upward. The 4th point lies at this level just behind the vertical leg bone. 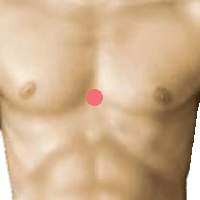 • 5th Point- This point is located four thumbs-widths above the navel. • 6th Point- This point is located two thumbs-widths vertically below the 2nd point. Repeat the treatment every thirty minutes till pain has reduced considerably. Nosebleed is a very common problem where blood oozes out of the nose due to excessive irritation form cold, infection, high blood pressure or hypertension. In most cases, it is not very serious and can be successfully treated with acupressure method. The treatment for Nosebleed involves three points. • 1st Point- This point lies at the outer (thumb side) end of the wrist crease. • 2nd Point- This point lies in the flesh between the thumbs and index finger. • 3rd Point- This point lies on both cheeks near the broad part of the nose. Applying pressure on this point also helps in unblocking nasal congestion. Following this treatment, the nose should be pinched firmly to block both the nostrils for a few seconds. Sunstroke or heatstroke is caused by over exposure of the body to heat. Sunstroke occurs when the body fails to exude excess heat and the major organs start to fail. In extreme cases it is accompanied by headaches, muscle cramps, hallucinations and fainting. Acupressure treatment can be used to recover the patient from sunstroke effectively. The treatment for sunstroke includes six points. 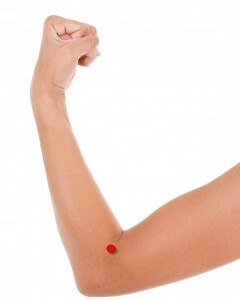 • 2nd Point- This point lies at the outer end of the elbow crease, when elbow is bent at right angle. • 3rd Point– If a vertical line is drawn on the palm starting between the ring and little finger and straight towards the wrist, this point would lie at the crossing of the line and the wrist crease. • 4th Point- You can feel two distinct muscles or balls at the fore sole of the feet. This point lies right between these two balls. Applying pressure at this point also helps in improving memory and concentration. • 5th Point- Two vertebrae stand distinctly prominent on the neck when we bend the head forward. This point is located between these two vertebrae. • 6th Point- This point is located just below the nose and above the upper lip. During a convulsion or an epilepsy attack, the patient may have a number of symptoms such as, unconsciousness, uncontrollable jerking or shaking, drooling or even loss of bladder control. In most cases, the attack is over within minutes, and the person gets back consciousness, but is drained out and dazed. Acupressure treatment has been shown to successfully pacify fits of epilepsy and convulsions. The treatment for convulsion involves three points. • 1st Point- If a vertical line is drawn on the palm starting between the ring and little finger and straight towards the wrist, this point would lie at the crossing of the line and the wrist crease. • 2nd Point-You can feel two distinct muscles or balls at the fore sole of the feet. This point lies right between these two balls. 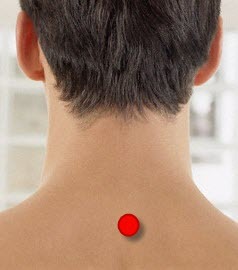 Stimulating this pressure point also helps in relieving back pain. • 3rd Point- This point is located just below the nose and above the upper lip. The patient’s arms and legs should be held down, and a thickly folded piece of cloth should be put inside the mouth in order to avoid injury. Fever or high body temperature is not an ailment by itself but is only an associated symptom of some other underlying cause. It is most commonly caused by infection, inflammation or side effects to some drugs. Acupressure treatment can be applied to successfully treat high fever. • 3rd Point- Bend your knee joint by 900, now move three thumbs-widths downward from the lower end of the knee cap. There you will be able to feel a pointed bone. This point is located one finger-width to the outer side of this bone. In addition, stimulating this point also helps in relieving knee pains. 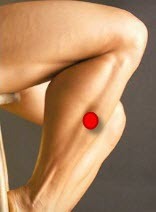 • 4th Point- From the tip of the ankle bone move four fingers-width upward. The 4th point lies at this level just behind the vertical leg bone. • 5th Point- If a vertical line is drawn on the palm starting between the ring and little finger and straight towards the wrist, this point would lie at the crossing of the line and the wrist crease. • 6th Point- Two vertebrae stand distinctly prominent on the neck when we bend the head forward. This point is located between these two vertebrae. Repeat the treatment every 15 minutes till temperature falls considerably. Whenever we are in pain, we try to get relief by pressing or massaging that part, and Acupressure is a unique science that evolved from this simple natural reflex. Reap the benefits of this amazing healing therapy with these simple reflexology treatments so that you are always better equipped for the unforeseen emergencies of life. Disclaimer: Please consult your physician before acting upon the above medical emergency acupressure points! Dear Jason and Cynthia, Please do experience acupressure and comment. Acupressure works wonders in case of emergency, where medical help is not available. Never blame alternate self help therapies without experiencing or suggesting an alternative for the common man in case of emergency. I have used the indicated points to stop 2 full blown asthma attacks when fast acting bronchodilators were not available. Very effective. Above said points is very useful to me. I had some days before upper back pain, so applied the points it gave me lot of relief. Thank you for your kind information. NEVER restrain the arms and legs of someone having a seizure. simply turn them on their side so they don’t choke on vomit or saliva and protect their head. restraining their limbs can cause them injury. it is NEVER safe to put ANTHING in someone’s mouth when they are having a seizure. this is very dangerous. please do some research and correct your advice above! We will definitely look into it, and thanks for reading our article so thoroughly. For the information to all, the points mentioned are too good. They produce excellent results. Points for Apendix are so good that Apendix can be cured in 7-10 days with dietary controls. No bread, butter or anything that is cooked three hours back. Eat with the organic clock pattern.